The Gulf Breeze/StreamLite 30RKP “Sun Deck” Travel Trailer featured at the recent National RV Trade Show in Louisville, Kentucky has been named “Best of Show” by the editors and staff of RV Pro, a leading industry publication. A popular focal point for RV Dealers and other show attendees, the 30RKP attracted a constant stream of admirers to the Gulf Stream display, who appreciated the innovative engineering that enabled the 6’ x 10’ Sun Deck to provide ideal outdoor space for owners and guests, without sacrificing comfort, luxury and convenience inside the unit. The sun deck features a 2,500 lb. capacity, a laminated floor with non-skid surface, a safety railing, an in-wall beverage refrigerator, and a weather-sealed media center for HDTV with a home theater sound and video system. Access to the deck is provided through a double sliding patio door and shade is offered by a power awning with LED atmosphere lighting. The interior of the 30RKP offers a choice of Prestige Maple or Light Roanoke Cherry handcrafted wood cabinetry, complimented by several designer-selected décor packages. The floor plan provides extensive storage and counter space, cool, efficient LED lighting, soft-pleated window shades, and popular options like stainless steel appliances, solid-surface countertops, and an electric fireplace/heater. Structurally, the 30RKP benefits from all the advantages of light-weight vacuum-bonded laminated fiberglass walls and floor, a welded aluminum skeleton frame, and an aerodynamic fiberglass front cap. 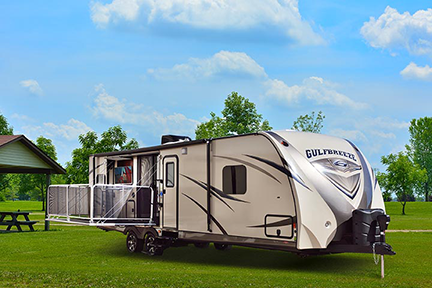 For more information on the 30RKP “Sun Deck” and the rest of the Gulf Breeze/StreamLite line from Gulf Stream Coach, contact National Sales Manager Tim Dennig (tdennig@gulfstreamcoach.com; 574-773-7761 x 5146). This entry was posted in News and tagged Gulfstream RV, RVs, Travle Trailers on April 1, 2015 by digitalhill.